I was at home in St. Louis last weekend to visit the family and to celebrate the nuptials of my younger cousin (not pictured, that's my brother on the right). With a detour through Chicago to visit Mary and Eugene, I had myself a regular Mid-West Adventure. Here's something about the Mid-West I forgot: they like meat. Lots of meat. At the rehersal dinner, we were served toasted ravioli (a St. Louis delicacy) and I asked what they were stuffed with. "Meat" was the reply. Not "Pork" or "Beef" ... just meat. Who can say where it all comes from. The capper was the Bloody Mary I had the following morning. The waiter asked if I wanted the special and I said sure. Apparently, the special Bloody Mary in St. Louis is served with extra olives, an asparagus spear and a quarter stick of salami! How many cocktails require processed pork to make? Is there some St. Louis variant on the manhattan that replaces the brandied cherries with pig's feet? I made it home to the rolling tofu hills of San Francisco without trouble. But I promptly came down with a cold. I blame some stowaway pepperoni for irritating my sensitive mucus membranes. 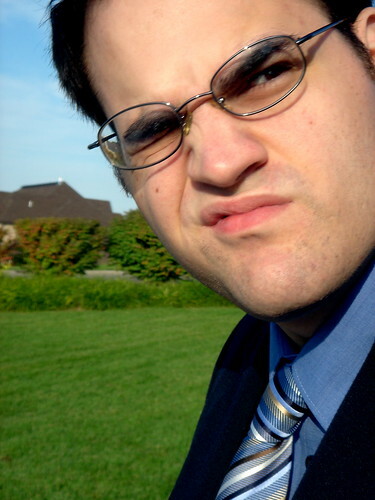 1) Why do you choose the stupidest damn pictures of me to post on your blog? I mean, I was asking for the seaweed-eating one, but come on. You're embarassing me in front of the ladies. 2) Can't you smite the spamm0rz with your googley might? As do close up pictures of my little brother sporting goofy faces. I just want to note that as a result of this trip I had the opportunity to spend significant time with the copter, and he looks exactly like that.